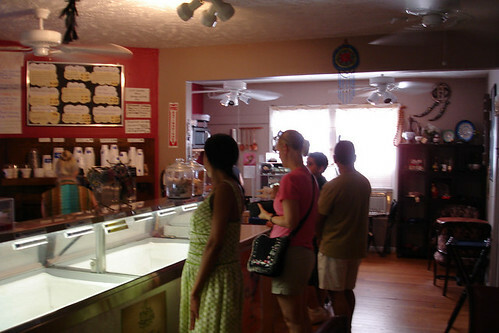 Beat the Heat – Ice Cream at Turkish Delights in Downtown Raleigh! 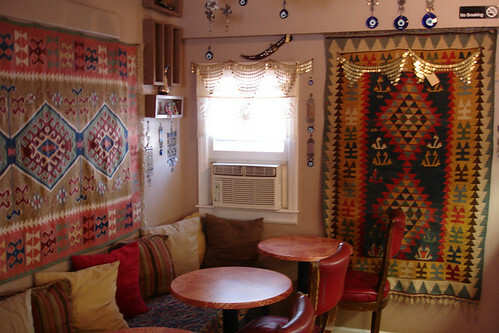 The next time you are in Downtown Raleigh and need to cool off, duck into Turkish Delights. 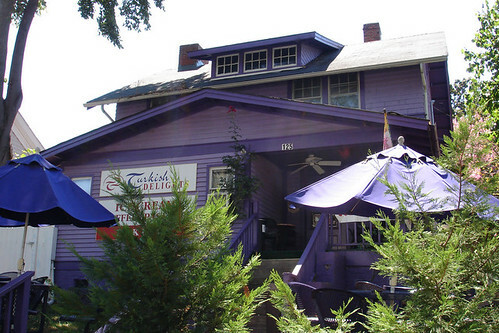 It’s hard too miss this the striking purple house located on the corner Glenwood Avenue. They serve great ice cream, shakes, and smoothies as well as Turkish pastries like Baklava, Kadafai, and Bourek. You can also grab a coffee or tea if that is more your style. They have both indoor and outdoor seating. The outdoor tables have nice umbrellas and are situated in the front yard which is slightly raised above the sidewalk along Gelnwood Avenue making for a nice view of the activity along the street. From the looks of the interior, it appears that the business takes up the entire first level of the building. It has a cool eclectic interior with several different seating areas with small tables and chairs and small pillows strewn about. It was really hot out the day my wife and I stopped by so we opted to get something cold. I got a a scope of caramel cheescake ice cream. It was very rich and tasted amazing. My wife got some sort of smoothie which was also very good. Their offerings are a little on the expensive side ($4.99 for double scoop of ice cream) but the quality makes it more than worth it. The flavors of ice cream they have range from your typical chocolate and vanilla, to more adventurous flavors like their popular “Garbage Can” ice cream which is made up of vanilla ice cream with pieces of seven different candy bars mixed in! This place is a unique expereince in downtown and as far as I know it is the only ice cream parlor around Glendwood Avenue. I’m looking forwad to going back soon and trying some of their baked goods. There several people buying Baklava when we were there and I’m itching to try some. Haven’t been there in years, but also recall they have the best stuffed grape leaves around.